Narrowing down my chosen profession is the opposite of what appeals to me. By its very nature, the path I’ve taken is holistic. I may be grabbing onto your limbs and body but I’m trying to help you access your soul. Deep healing only comes from working through layers of being. Is what I do yoga? Yes. Is what I do Thai massage? Yes. Is what I do yoga therapy? Yes. Wellness education? Yes. It’s a mix of all of these things. Any information I have, I just pass it along. If you’re working with massage therapists who aren’t educating you I think that’s falling down on the job. If you want something completely different, something completely new to help you access deeper levels of your own healing, then you come to me. If you say, $130.00 a session! Wow, that’s expensive. Then I may not be what you’re looking for. My busy practice and growing clientele seems happy to pay for a quality service they can’t get elsewhere. Does your massage therapist meditate? Do they do yoga to calm their own nervous system so they can listen to your body more? Those are the questions the public should be asking massage therapists. If you’re not into those things, well, there’s a spa down the road where a therapist will be happy to slap some cream on your back. 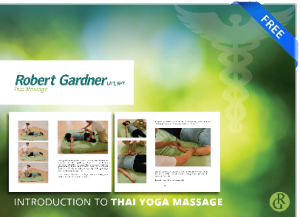 http://www.robertgardnerwellness.com/wp-content/uploads/2013/04/Robert-Gardner-Wellness-Thai-Massage-Header2.png 0 0 Robert Gardner http://www.robertgardnerwellness.com/wp-content/uploads/2013/04/Robert-Gardner-Wellness-Thai-Massage-Header2.png Robert Gardner2013-03-26 22:50:212013-03-26 22:50:21What do you do?